03:04 Brackston Hi all, Is there a way to keep mobs from spawning in certain areas, such as spawn? 03:04 bigfoot547 If you modify the code, sure! 03:16 Brackston silent_elk Protected by "area" mod, using protection blocks, or both? 03:16 Brackston Ok thx, I appreciate your help. 03:18 Brackston I remember reading some code a while back and it pertained to mobs not spawning..I could not remember where I saw it. Thanks I will go look at that. 03:25 Brackston I can mod this to fit our games area.. since new players will not have weapons until they finish basic skills tests. 03:52 bigfoot547 Sorry, I can't help you. I've never used schematics. 03:52 wilkgr Nexus24680, what's the error? 04:02 Nexus24680 I'm no coder. 04:02 Nexus24680 What should I do? 04:05 Brackston go there and right click the download button ad "save as"
04:11 Nexus24680_ Do I put it in a textures folder? 04:13 Brackston tyes, you can, but why not just download the latest "version" from github? It has it already. 04:14 Brackston is this for a server or just for your local play? 04:33 Brackston wilkgr: The mod you told me about is easier to use than I thought. I will work well. 04:35 wilkgr If the channel isn't registered..
06:45 Brackston I have been searching and reading, however I have not found anything...yet. 06:55 Brackston I will try to fix this tomorrow. Have good night everyone. 08:08 sigz Is there a way to detect the biome where a player is ? 10:00 sigz which easy tweaks? 10:35 hisforever Hi I just installed a new minetest 0.4.16. I have the dreambuilder_modpac_master. Hoe shourd I remane this file? 11:15 IhrFussel Does the removal of entities only work when a player is nearby? 11:34 Wuzzy celeron55: why is WSDguy2014 still unable to register on forum.minetest.net? 11:51 sfan5 doesn't the script api need to do that? 11:55 sfan5 you can say "i want exactly this MapBlock"
11:58 IhrFussel sfan5, how is forceloading supposed to be useful then? It doesn't even have a RADIUS parameter ... what if my entity since MOVED out of the spawn block? 12:11 sfan5 what if it moves more than 100 nodes? 14:14 DS-minetest are the overly tiles not colored or the normal tiles not if the overly ones are given? 14:19 IhrFussel What? 1 sec is too long? 14:51 MinetestBot so_this_broke: Nothing to calculate. 15:01 MinetestBot BBmine: Could not find anything. 15:03 * Raven262 has to test something. 15:07 Raven262 I'm not spamming him, I'm talking to him. 15:07 MinetestBot sfan5: 'Raven262! *@*' added to ignore list. 15:09 MinetestBot sfan5: 'Raven262! *@*' removed from ignore list. 16:28 Alcyone2 Hi all ! 16:29 red-001 Alcyone2, could you paste the mod list? 16:33 DS-minetest lol, there's a "red-001," mod! 16:34 red-001 does worldedit also include worledit gui? 16:38 Alcyone2 Except for creative mod, does anyone has a clue ? 16:47 Alcyone2 You mean that from minetest, it is possible to execute code who can touch all the system oO ? 16:49 sfan5 did minetest run as administrator? 16:51 sfan5 yeah but under which user? 16:52 fwhcat is there a lua function to redirect a user to another server? 16:52 red-001 Alcyone2, was mod security enabled? 16:53 red-001 I was pretty sure you could enable it if you wanted right? 16:53 Alcyone2 sfan5, what do you mean by reinstalling ? 16:55 fwhcat Alcyone2, did they changed your password ? 16:56 fwhcat were you sudoer with the dangerous NO PASSWD option ? 16:56 Alcyone2 fwhcat, hell no ! 16:58 IhrFussel The password is NOT stored in any accessible file AFAIK so how would they do that? 17:00 Alcyone2 red-001, erase proofs ? 17:00 IhrFussel And you try to tell me that you can do that via Lua? 17:00 fwhcat some privilege escalation and then can change some binaries etc. 17:00 red-001 os.execute shouldn't log to shell history should it? 17:04 red-001 Alcyone2, did they try to attack other machines on the same network? 17:15 Nexus24680 Is it possible to modify stock minetest? 17:16 Nexus24680 Is there any way to prevent this? 17:16 fwhcat yes, learn git. 17:17 Nexus24680 What file do I have to edit for that? 17:17 fwhcat you branch, and you control what you merge to it, as it will ask you when there will be a conflict. 17:21 Nexus24680 Yeah, sort of. 17:21 Nexus24680 How can I achieve that? 17:21 twoelk what exactly do you want to change? 17:22 twoelk game? texture? engine? 17:22 Nexus24680 For example, as Freeminer uses the same engine as Minetest, I would like to remove the mobs from the stock game. 17:28 twoelk are you playing local or on a server? 17:29 twoelk freeminer is shut down while you delete the files? 17:30 Nexus24680 Is there a way to modify that compressed package? 17:31 Nexus24680 With an APK editor? 17:32 Nexus24680 Any of you knows Android Code? 17:33 Nexus24680 å±±ãƒ¢ã„¥ã„¥, ã„¥'çˆª ãƒ å£ã‚Œã‚Œä¸¹ ï¼³åŒ•ä¸¹å°ºåŒ• çˆªå£åˆ€å·¥ä¸‹ã„šå·¥ã‚Œãƒ å·¥åŒ•. 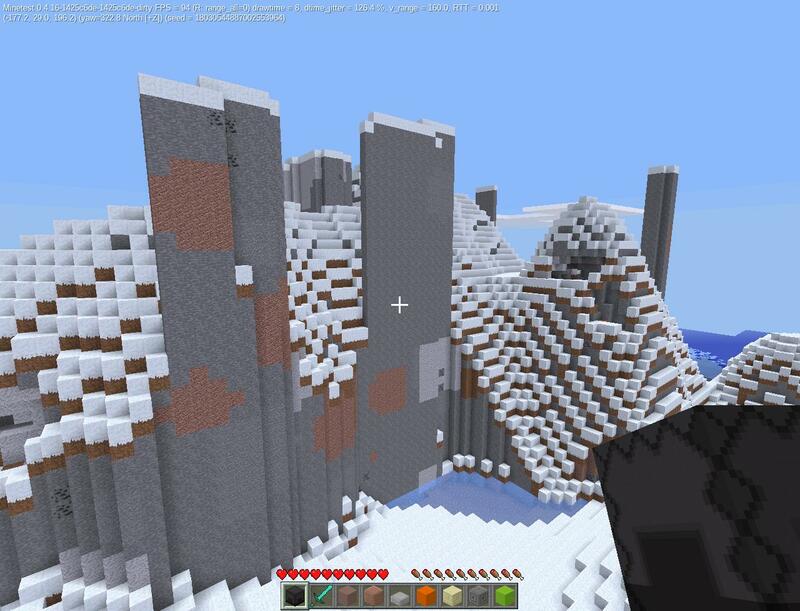 17:34 Nexus24680 How to enable subgames on Minetest for Android? 17:35 twoelk does mtg show up as icon at the bottom of the main screen? 17:38 Nexus24680 Can you help me finding stock mods for this subgame? 17:38 Nexus24680 Can you help me with that? 17:44 twoelk oh dear, did wuzzy reorganize everything in mc2? 17:45 Wuzzy what do you mean? 17:47 Wuzzy twoelk: why the rant, by the way? 17:48 Nexus24680 Wuzzy, you're the creator of MCL2, right? 17:48 Nexus24680 Can you help me with the MCL2 mods? 17:49 Wuzzy which mods in precise? 17:52 Wuzzy btw why do you want *all* most standalone? what are you up to? 17:56 Wuzzy which mod dependency is the most painful to you right now? 17:56 Nexus24680 How can I make them start dalone? 17:58 Wuzzy maybe its not small enough? 17:58 twoelk why not just instal core? 18:01 Wuzzy WHY do you want all most standalone? 18:01 Wuzzy what do you mean, "port it"? 18:01 twoelk port to what? 18:01 Wuzzy isn't MT portable enough already? 18:01 twoelk are you trying to play it on android? 18:03 Wuzzy if there would be a PROPER Minetest build on Android, you could play any subgame on android, as long you have enough resources. Right? 18:04 red-001 can you even select diffrent subgames on android? 18:04 Wuzzy oh, wait. the android build does not let you install other subgames, right? So you are stuck with Minetest Game. Right? 18:06 Wuzzy PC supports all subgames. 18:07 Wuzzy by making all or most dependencies optional. 18:08 Nexus24680 Can you do it? 18:11 Wuzzy which mods do you think are the most important ones for you? 18:19 Nexus24680 That means structures doesn't work? 18:19 Nexus24680 So, should I not pick it? 18:20 Wuzzy "port" = "decouple"
18:20 Nexus24680 Does it have the original MC villages? 18:22 Nexus24680 Is it possible for them to spawn using stock blocks? 18:24 twoelk doesn't Sokomines mg-villages do something similar? 18:24 Nexus24680 I'm no coder but would it work if you replace, for example, MCL_sandstone_block with sandstone_block? 18:28 Nexus24680 Before continuing, which mods you suggest? 18:29 twoelk standards in modding? stop all the anarchy there? but then one would have to study some standards before making a mod; eek! 18:29 Nexus24680 For you, what are the most important if you were to port them? 18:40 Wuzzy that actually is already standalone. 18:46 Nexus24680 Can you make a animal-coded-only version? 18:46 Wuzzy wouldn't it make more sense to introduce a Mobs Redo setting which only spawns peaceful mobs / animals? 18:48 Wuzzy hmm so we have mobs_mc_monster and mobs_mc_animal? 18:48 Alcyone2 red-001, it doesn't seem to be any problem on the server but it needs further checkings. Still I didn't succeed t create a systemd deamon with a user created for this purpose. 18:49 Wuzzy what is wrong about only_peaceful_mobs = true? 18:51 Wuzzy the problem with standalone mods (for me) is. 18:52 twoelk maybe editing a config file on android doesn't work as expected? 18:54 Nexus24680 Todo near or todo far? 18:58 Nexus24680 OK, Wuzzy, can I do the work of removing the dependencies myself? 18:59 red-001 did the attack wipe debug.txt? 19:00 Wuzzy which mods do you want to attack first? 19:03 Alcyone2 red-001, no soucy, I may find one day ;) remind me where si located debug.txt ? 19:05 red-001 Alcyone2, any chance you could recover the contents of debug.txt? 19:05 Alcyone2 red-001, where is located debug.txt ? 19:15 Alcyone2 red-001, you mean, where the world is located ? 19:20 Wuzzy is there a mod named Wuzzy? 19:23 Wuzzy did they really just write "Allow access above"
19:29 red-001 whats in the file? 19:29 Wuzzy Alcyone2: on which OS are you? 19:31 Wuzzy shouldnt it be $HOME/.minetest/mods? 19:31 red-001 with the motto, "A bit less stale then XP"
19:33 Alcyone2 Wuzzy, what do you use as OS ? 19:33 red-001 whats inside the file? 19:34 red-001 do you see something like "ACTION[Server]: singleplayer digs default:stone at (131,-2,-141)"
19:34 Wuzzy Bad Debian! Bad! Now sit down, you bad, bad distro. 19:35 Wuzzy why the hell did they rename the file? 19:35 Wuzzy when will Minetest switch to XDG? 19:39 Wuzzy does Debian at least have documentation on how they fucked with Minetest? 19:39 red-001 what filesystem are you using? 19:39 Wuzzy haha, Debian is really a constant source of !!!FUN!!! 19:40 Wuzzy why am I not surprised? 19:44 Calinou <Wuzzy> when will Minetest switch to XDG? 19:45 habeangur Can I upload many pictures from minetest wiki to another wiki? 19:46 Alcyone2 with a message like "Howdy I'm FLOWEY !" 19:48 Alcyone2 red-001, if they use it, or many people do it, there is even a wiki page "setting up a server on Debian"
19:48 red-001 any idea whats the motivation behind the attack? 19:49 Alcyone2 Wuzzy, really by curiosity, what is your OS ? 19:49 Alcyone2 red-001, trolling maybe ? 19:53 Calinou what's wrong with it? 19:53 Calinou try "systemctl status minetest"
20:08 habeangur Calinou: the same for screenshots on minetest.net? 20:18 calcul0n maybe the same thing here ? 20:23 Brackston I hate to go back to 4.15 and loose colored items on one server , but I am a moderator on TPS Servers, so I need to have chat working for me. 23:33 Nexus24680 Wuzzy, are you connected? 23:35 Nexus24680 Wuzzy, are you connected? 23:37 Nexus24680 Any of you has idea of how to tag here? 23:38 Nexus24680 red-001: Like this?